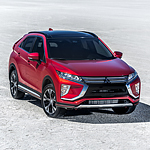 The Mitsubishi Eclipse Cross is a stylish and rugged crossover SUV that not nonetheless includes a number of driver and passenger-centric technology features. These include specialized displays as well as advanced suspension systems. The Mitsubishi Eclipse Cross provides drivers with the extra convenience of touchpad control. With the touch of a finger, drivers can interact with and control a number of critical vehicle related systems. At the same time, the Eclipse Cross allows drivers to keep their eyes on the roads with the application of the available heads up display system. This system projects a small, translucent screen with vital vehicle related information such as speed and location. In addition to these visual tools, the Eclipse Cross also provides operators with specialized suspension systems. This includes the Super All-Wheel Control (SAWC) system. This system selects the proper 4-wheel or 2-wheel drive configuration for prevailing road conditions, thus promoting safety.